I love to swim! I especially love swimming in places where I know there is nothing too big that’s going to come out and try to get a piece of me. 😉 Las Grietas is just such a place, but it’s much more than that! Want to photograph these areas on your trip? Here’s how to choose Best Camera for Travel. Growing up in Nova Scotia, Canada I loved going camping in August and swimming in the lakes. There was also a cool spot in the woods called Three Pools, where a little river ran down over waterfalls and pooled in three different areas, each at the bottom of a different waterfall. While I love those places, Las Grietas is even better. Las Grietas is a stretch of inland crystal clear emerald green water at the bottom of an earth fracture! It’s found on Santa Cruz Island in the Galapagos Islands. It’s over 10 meters deep, 7 meters wide and 100 meters long. It’s fed underground by a river from one end and ocean water from the other. The water is cool and brackish. There are cliffs of dark volcanic rock rising up on each side which make a dramatic contrast against the emerald green water. Las Grietas is so ruggedly beautiful! The path to Las Grietas took us across volcanic rock and through scrubby bushes. I was not expecting to see such clear emerald water that far from the ocean. I had never seen anything like that before. I’m so glad the sun was shining that day, I think the color of the water would appear really different on a dull day. The water was so clear! It was an amazing sight to put on a mask and see the jagged cliff walls going down, down, down… I could see all the way to the white sand bottom! There were some large fish hanging around near the cliff sides but the water was so clear and deep that I couldn’t really tell how big or how far down they were. My perception was thrown off because there was nothing down there to judge anything against. There were just the dark cliff sides and a long clear water filled canal going down the middle. The water was also very calm, at least it was when people were not climbing up the cliffs to jump in. Las Grietas is definitely the most unique place I’ve ever swam in. It’s also one of my favorites… so far. The atmosphere was really neat the day we were there. There were travelers from all over the place, we could hear a number of different languages and accents. Everyone seemed to feel the same way we did about being there. Las Grietas is on Santa Cruz Island in the Galapagos Islands. It’s a place you can go without a guide, unlike many of the other areas on the Galapagos. You’ll need to take a water taxi across Academy Bay to Angermeyer Point. 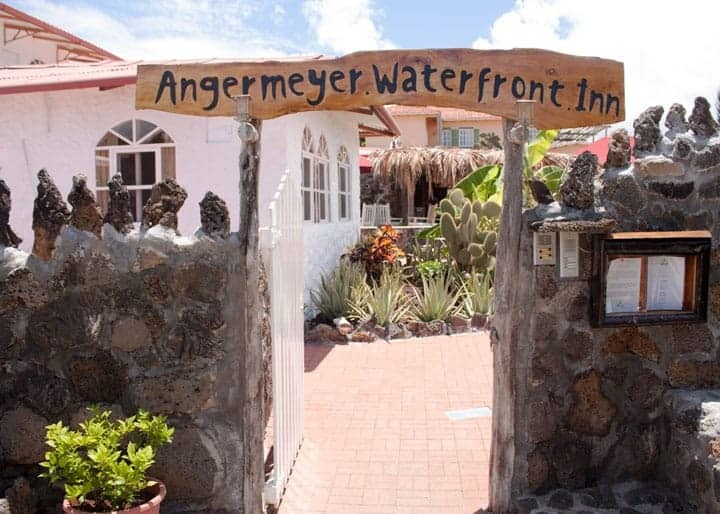 You’ll walk by the Angermeyer Waterfront Inn, a small beach, then down a path which takes you out by a salt lake and across some lava rock, and then through a small wooded area. We went with a guide because we were working with Red Mangrove Galapagos Lodges at the time. I would recommend going with a guide especially if you have children and are concerned about getting lost. It would be best to wear good quality hiking sandals, the kind with a good tread that you could also swim in. Having to mess around with sneakers while trying to balance on lava rocks in bare feet was not all that much fun. Everything else was amazing! Have you been to Las Grietas? Where is your favorite swimming spot? Please share your experiences by commenting on this post. I loved Three Pools growing up. Of course it was practically my back yard! I long for the long hot summers spent there…falling freely from the cliffs into the cool water! Swimming in the Dead Sea – Israel with the salt as sand, mud for your body outsie self smeared, rinse with sulperic water, Red Sea – Egypt….also super salty..talk about colorful saltwater fish…but I did it at sunset WOW. The mosr exciting well into the Sea of Cortez snrkling with the sea lions. I’m an excellent swimmer but these cute and fuzzies on land are a different territorial, hungry creature in the wild. the bull is 2,000 pounds and the protective mothers come at you with sharp teeth bared as their babies. I thought Lord take me now this how I want to go! Thanks for posting this! There is a place similar to this in Oregon except it is a river with three 8 foot waterfalls and three pools. It is actually called “three pools park”. The rock cliffs on either side range from 4ft to 45ft and are so much fun to climb and jump off. I really miss how much fun I had there as a kid with my dad and siblings. I’ll be spending May – July in Cuenca with my wife and son. We will definitely make plans to visit this spot! What does it cost to travel to the Golopagas Islands? Also if you are not a resident of Ecuador, is there special requirements? You must be excited, the Galapagos islands are amazing! Have fun at Las Grietas. I hope it’s a sunny day when you go, that water is just so beautiful.